Window replacement projects can be a lot of work! There are so many difficult choices and decisions to be made, so you aren’t alone if you feel a little overwhelmed at times. Once you have decided on the style, color and the window material for your Brampton vinyl windows, you may think your job is done. However, you did miss one important aspect of vinyl windows that many people overlook: the security and locking systems. While this is one of the first features that Brampton homeowners look at when selecting entry doors, nobody thinks about windows being a vulnerable place for a break-ins. Thieves will come in either through the door or windows, so provided you have already invested in quality doors and door locks, windows are your weakest point of entry. The best thing you can do for your Brampton home’s safety is to make sure that your new window installation team uses the latest in window technology. Window technology has advanced significantly during the past 10 years or so, and today you can choose from and exciting vinyl window features and options available. Here at Brock Doors and Windows, we utilize the latest technology to provide you with a superior product that will durably serve you for years to come. Did you know that you can boost your home’s safety by making sure your windows are properly secured? Yep, it’s as simple as that. In fact, as we said earlier, one of the most important-and most often overlooked aspect of home improvements are the windows, and particularly locking systems. When you are choosing your window’s hardware, look for multi-point locking systems, because more than one lock offers you far greater security and a better seal. Always try and choose hardware that is from a well-known brand or manufacturer with a long-standing reputation for high quality. Another option available now are “sliding window glides”, making for much easier cleaning and smoother movement. Reinforced glass is available in several options for your replacement windows. One choice available is tempered glass. This is far more durable than plain glass and therefore, is much more difficult to cause a crack or chip. Tempered glass is the most affordable option apart from traditional glass, but still a little pricey in comparison. Laminated glass (also called safety glass) is another great choice for home windows. Laminated glass will typically be formed from a layer of vinyl that is sandwiched between two regular sheets of glass. In order to break through safety glass, the thief would have pound the glass over and over in the same spot, creating a lot of noise while he did so. 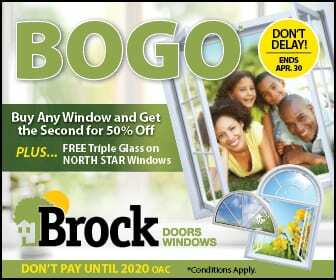 At Brock Doors and Windows, we are proud to serve Brampton and the surrounding areas with superior windows and customer service. Please feel free to call and schedule your free consultation.